Washes generally flow intermittantly after heavy rains, a feast or famine of water that creates specific plant communities. Roadside water runoff can also create a microhabitat of its own. The sacred datura, also called jimson weed or thorn apple, thrives in this water runoff, making it standout along roads. 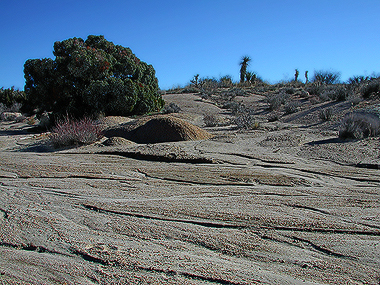 Unlike the sparse vegetation in most of the Mojave, plantlife in washes is lush and deep-rooted. Plants range from shrubs such as the catclaw acacia, cheesebush, four-wing saltbush, and bush senecio to taller trees such as desert willow and cottonwood. Look on the branches of the shrubby catclaw acacia for clumps of desert mistletoe, a parasitic plant. Mistletoe attracts phainopepla, a small tufted black bird that eats--and disperses--its berries. Water attracts many other birds, including migratory finches, orioles, and tanagers, as well as animals such as the red-spotted toad. Blacktail jackrabbit, recognized by large, black-tipped ears and a black-topped tail, is generally nocturnal. As fast as jackrabbits are, they may not be able to outrun a coyote, one of the few natural predators in this region.